It's been a while since my last post, after our last house sit in Wales. 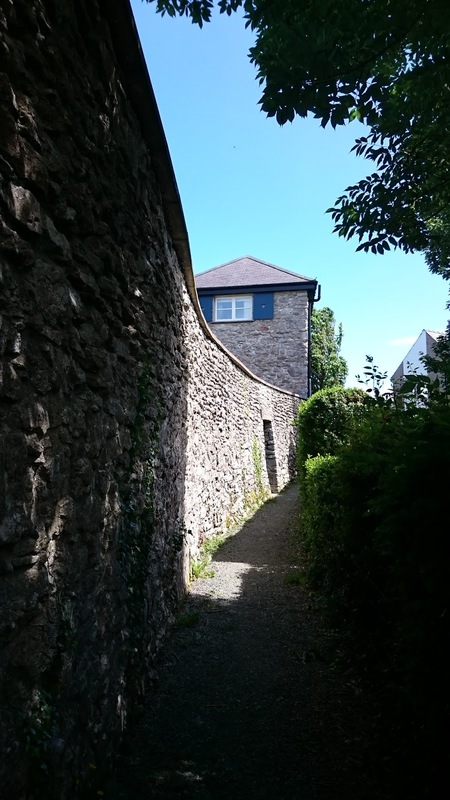 Some of that time was spent negotiating offers on our house; at the time it looked like it was going nowhere, but once we returned home one offer firmed up (and moved to the right side of sensible!). Since then it's been the usual, painful process of solicitors, searches, surveys. When pretty much everything is now available online, I have no idea why it still takes 8 - 12 weeks to sell a house. Despite having first time buyers (so no 'chain pain') it seems to have been a long and torturous road. The good news is that contracts have been exchanged and a completion date agreed. We're pretty much up to date with the logistics of moving - funds in place, just about everything packed ready to go into storage (thanks to Cathy, who is amazingly organised when it comes to packing), address changes ready to go. Our house purchase (a lovely bungalow on Anglesey) is running behind the curve, mainly delays at their solicitor's end, but also our tardy surveyor, who 'forgot' to book it in, so losing us about 3 weeks on the timeline. We'd planned on having a short air gap between selling and buying (listing our house as 'no onward chain' definitely helped), but we'll be living in Nido in the interim. This was fine when we hoped to sell the house in the summer, but as winter fast approaches, the days shorten and the wind and rain becomes more frequent, the thought of living in a 6m x 2m tin box for longer than a couple of weeks isn't so enamouring! With contracts signed (but nowhere near being exchanged), we don't need to stay too close to here, so could head off somewhere for a few days. But sod's law says as soon as we organise that, the bottlenecks will open up and it'll be time to move. We're leaving our car at Cathy's sisters and will aim to find CLs or CSs with hardstanding and electricity; we don't want to sink into soft ground and we do want to be warm and dry. 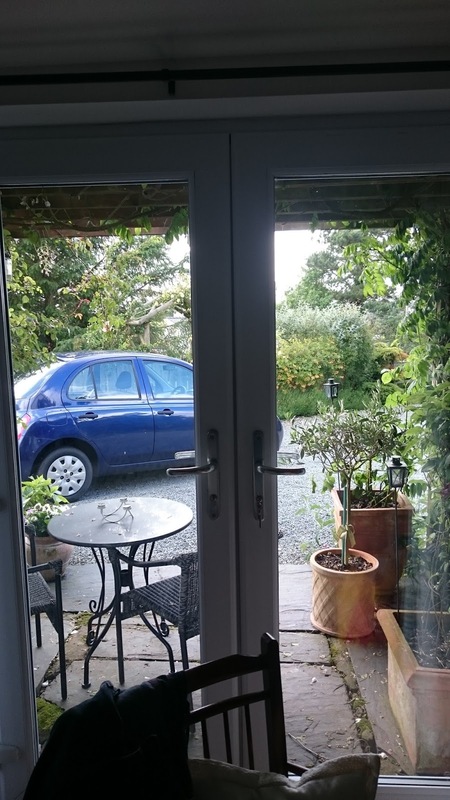 It's taken nine months to shift this house, much longer than we expected, but we're finally started to get excited about moving to the Isle of Anglesey. 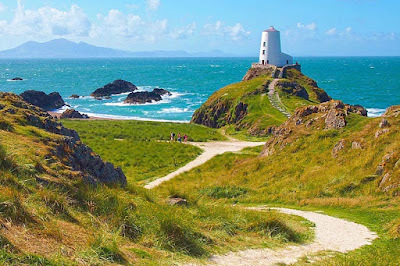 We'll be living about 3 miles from the coast and close to Newborough forest, beach and Llanddwyn island, one of our favourite spots. The new place is only 20 years old so we can move in without a major refit (a first for us! ), aside from some decorating and extending the drive to fit the van. 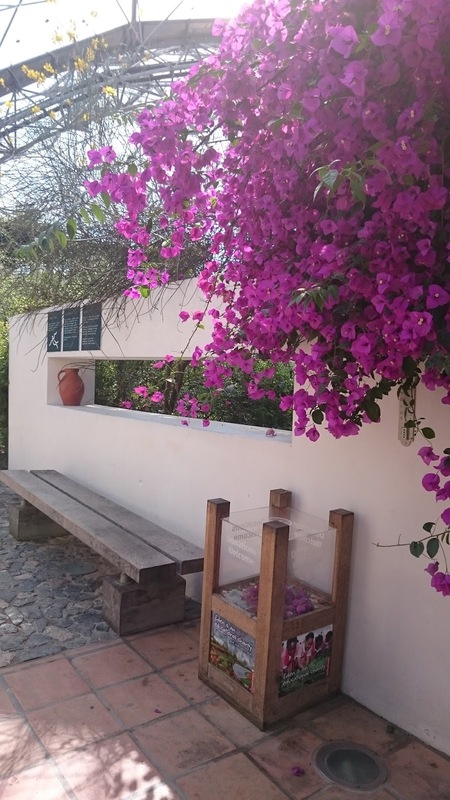 We're really looking forward to settling in, getting to know the local area and the wider island and finally starting the enjoy the benefits of early retirement; it feels like we've been in limbo for the past few months. So our planned winter trip to Spain and Portugal has been put on hold to allow us to move and get the house sorted, although we are planning to head south around March next year for about 3 months. 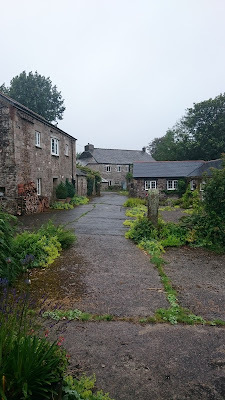 Our next house sit was deep in the Welsh countryside in the county of Carmenshire, in the tiny village of Maesycrugiau, near the market town of Lampeter. We've been to this area before when we did a house sit south of Camarthen last Easter. 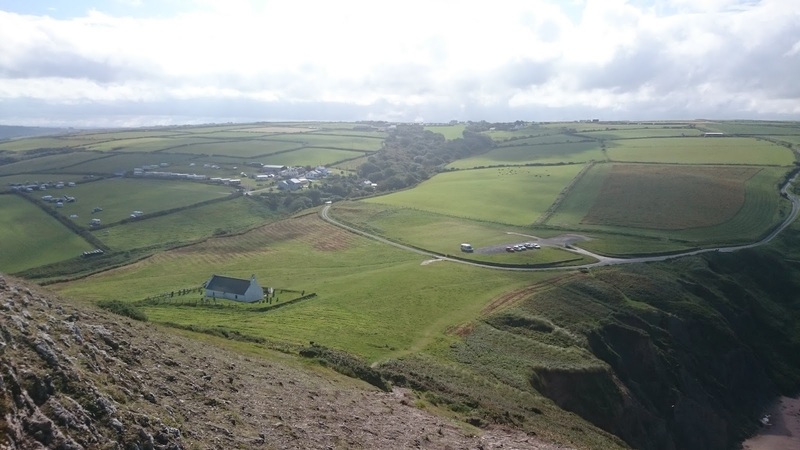 We spent a few days making our way down in the campervan beforehand. 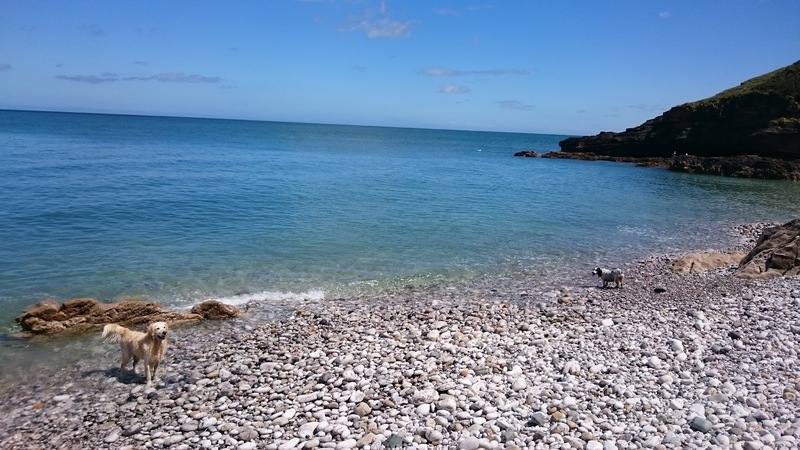 Our first stop was planned to be a C&CC temporary holiday site in Criccieth. 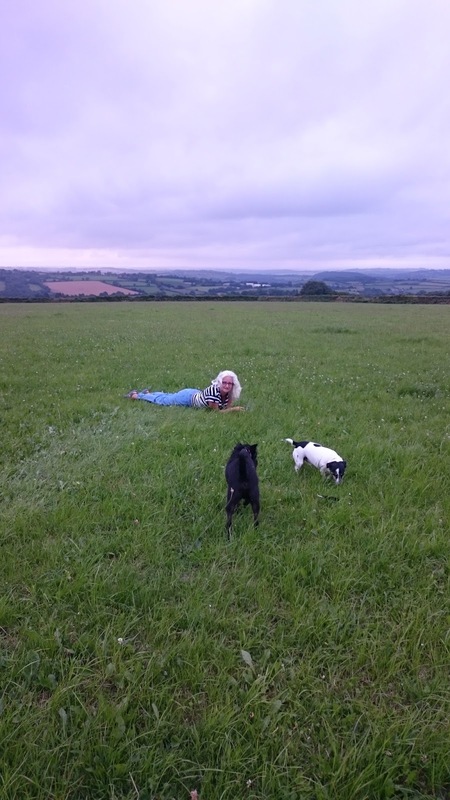 However, on arrival, we were unable to get the van up the steeply sloping field, which was very wet underfoot. 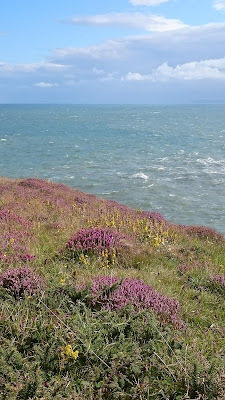 So Plan B was another THS just outside Tywyn, close to the sea. 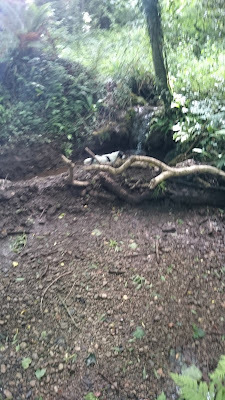 This one was in a fairly level field, although again quite wet. We'd planned to stay for a couple of nights; but while the campsite was OK, the town and seafront was very tired. We'd already booked a C&MC CL (5-pitch site) in the hamlet of Forge, just outside Machynlleth (CL is called Plas Forge) for the third night so we rang them and booked another night. On arrival I had a walk around to test the ground - more soggy field! But there was a long, gravelled road in and we were able to park on it at the bottom. It was a beautiful spot, surrounded by mountains and trees, with a river running alongside the site. We spoke to the owner and he told us he fed the kites each day at 3pm. About an hour before these large birds of prey started to appear, calling and circling overhead, an amazing sight. We walked up to the road to get a better view and watched them circle, turn and then, en-masse, swoop down to grab some meat. It was incredible to see so many; we counted 28 but the owner told us up to 50 came on one occasion last year! They stayed around for another hour or so before dispersing back to their own territory. 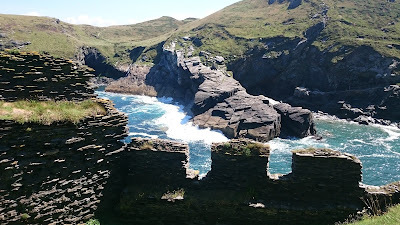 The next morning we followed a circular walk of about 7 miles; the owner kindly lent us an OS map. It was a lovely walk, a mix of lanes, forest paths, hills and open fields, surrounded by mountains in all directions. 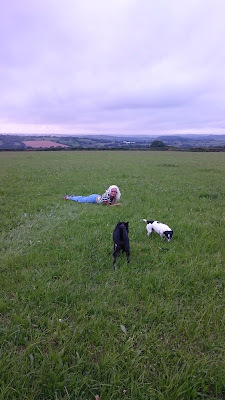 We only met one couple walking, plus one man as we chatted to a lady who lived on one of the farms we passed through. It was a very warm day with plenty of sunshine. As we returned to the van the last of the kites were circling after feeding time and the rain started. Showered and fed, the man we'd seen out walking came into the site to camp. 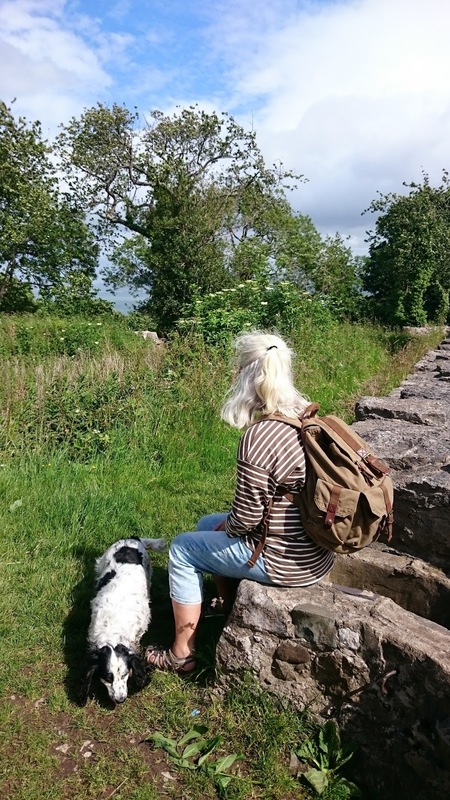 His name was Rob and he's walking the Glyndŵr's Way, some of which we covered today. He was carrying his tent and belongings and had been walking for some days. We made him a brew and sat outside to chat to him; a really nice guy. We offered him some hot water and our blue bucket so he could clean up as this site has no facilities; we know how great a hot wash is after a long walk. Today we also had news from our estate agent that an increased offer had been made on our house, which we accepted - let's see if this one actually gets to exchange! So these last two days in the peace and quiet were very relaxing and I think we'll definitely be coming back to this past of Wales. 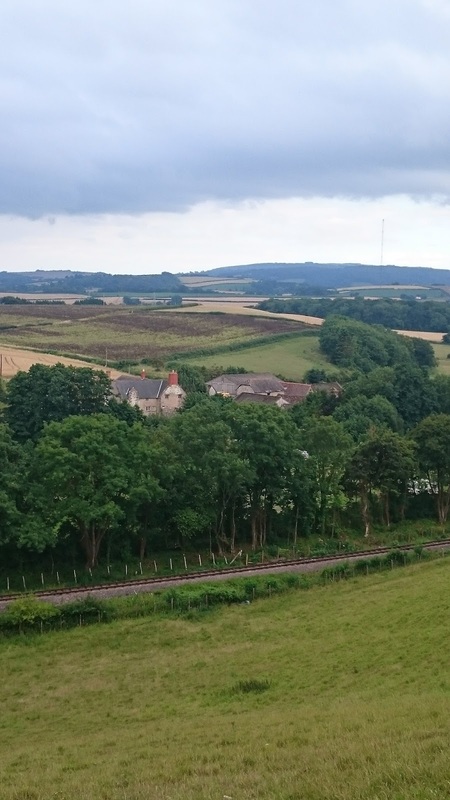 We're looking after a large detached house which, until the early 1980s, was the village post office and, in earlier days, also the telephone exchange. The owners have been here a few months and have started a large programme of refurbishment. There's a large garden around the house which attracts many wild birds, plus another landscaped garden with a pond just across the road, looking over the valley and hills. They also have two acres of land. One is a young orchard with a polytunnel and some veg beds; part of our job was to keep them maintained and watered, plus enjoy the veg. The other field is a wildflower meadow. They have plans to turn this into a small campsite. The house is in a small hamlet in a village a few miles from Lampeter. 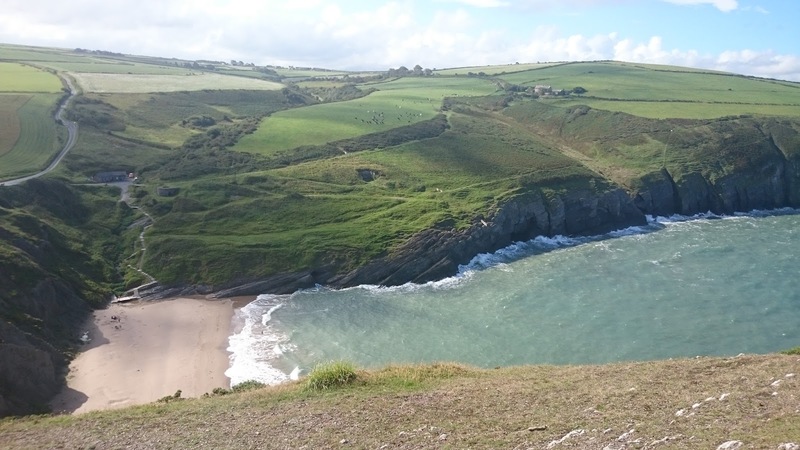 It's close to the river Teifi, which is a popular fly-fishing river. It was very quiet here with no artificial light, so on clear evenings (not many as it rained most days!) the milky way was very bright. We walked alongside the river and down some of the quiet lanes. 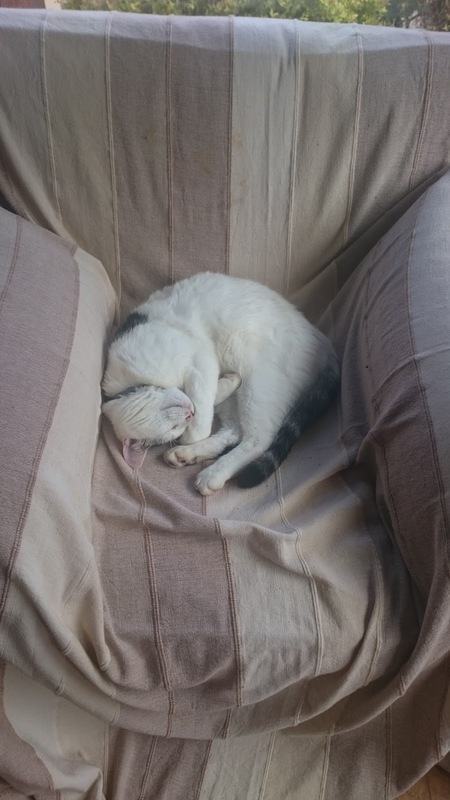 We looked after three lovely cats: Twizzle, Smee and Fidget. They all had their own personalities and characters and were clearly loving the country life, often only appearing at meal times. We soon knew we were in their gang, as they left us a few headless 'presents' on the kitchen floor! They were easy to look after and eventually came to sit with us. Although not strictly pets, we also fed the birds plus put out special food for the hedgehogs to enjoy at night. 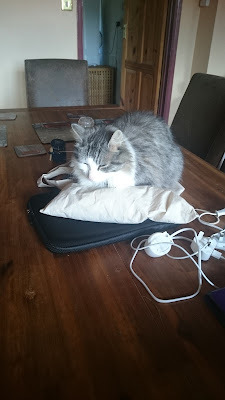 Here's photos of the cats; Fidget lived up to his name and took an age to get his photo! Smee - assuming the position! Fidget is hard to capture - he found the Mac cover a warm spot! The weather was a bit mixed but we still managed to get a few jobs done. 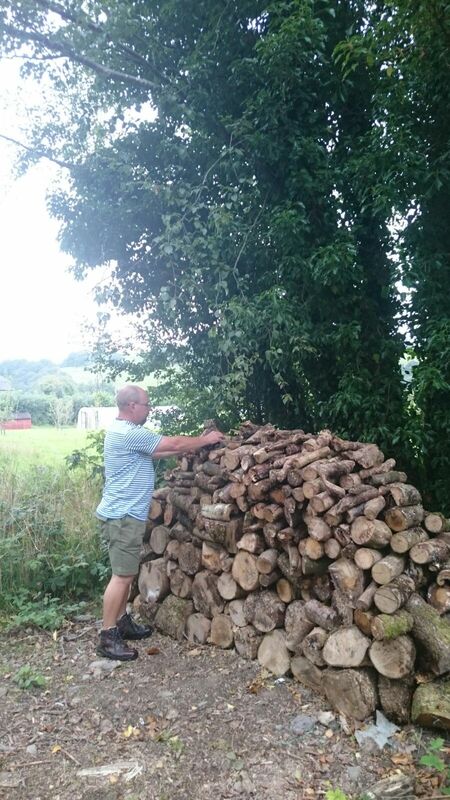 This included stacking a huge pile of logs near the top wildflower field, weeding and cleaning the wooden decking. We also spent time in the polytunnel, watering, weeding and picking some lovely veg, which we enjoyed each day. 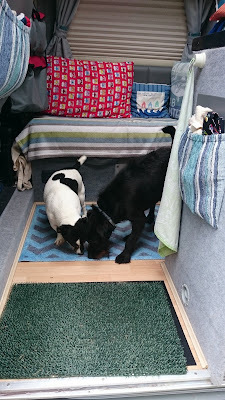 On the first Sunday we drove to Pembrey Country Park, on the coast, to meet up with some friends from Gosport who were camping in their caravan. It was great to see them again and have a good chat. They made us a lovely lunch and we enjoyed a walk along the beach with their dog Meg; however the very strong wind and rain on that day curtailed the walk. We also had a sunny but very windy day out on the beach at Traeth Mwnt on the Ceredigion coast, close to Aberporth. 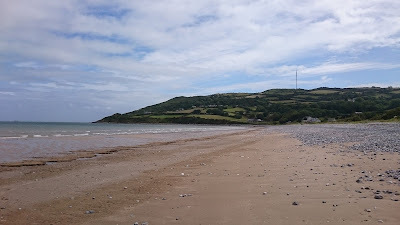 I'd anchored off Aberporth several times in warships, as it has an MOD site that monitors and analyses high seas missile firings, particularly surface to surface missiles. We also had a day out at the Dolaucothi gold mine, which included a great guided tour. The owners returned after their 10 day break late on Sunday evening. I cooked a chicken curry, aloo gobi (using their home grown potatoes and cauliflower), and rice and we sat eating and catching up on our respective weeks. 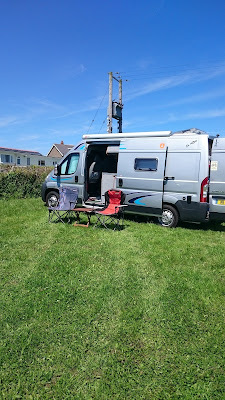 We slept in the van that night as we need to leave early the next morning as we'd arranged a few house viewings on Anglesey, basing ourselves at another Camping and Caravanning Club temporary holiday sites at Treaddur Bay. 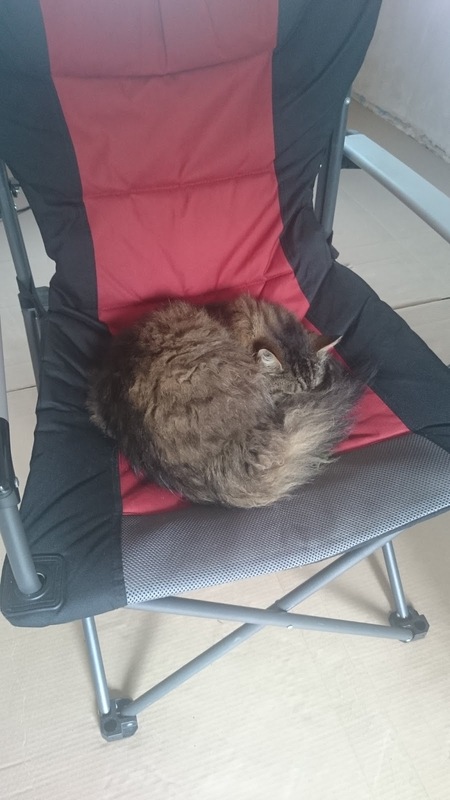 This is our second house-sit since we retired, our longest yet. I saw this house sit advertised a few weeks ago, we contacted the owner and had a good chat over the phone, so were really happy to get the gig. She'd written a very detailed handover pack, so that helped us prepare. She asked us to arrive the day before she was leaving so we could get to know the two dogs (or more likely they could get to know us!) and to allow a comprehensive handover. 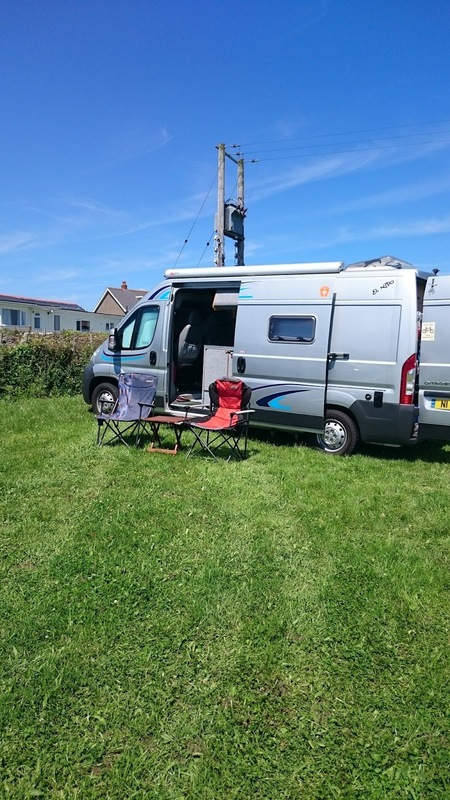 We broke our journey down to Cornwall with a stop at a small Caravan and Motorhome Club CS in Lympsham, just outside Weston Super Mare, in Somerset. It was basically a three acre field next to the owners' farm, basic with no electric hook up, but the usual fresh water, waste dump and bins. At £5 for the night it was a bargain and we were joined for a while by their Jack Russell, who came over to check us out and enjoy a tickle - he earned one of the doggy biscuits we keep in the van! 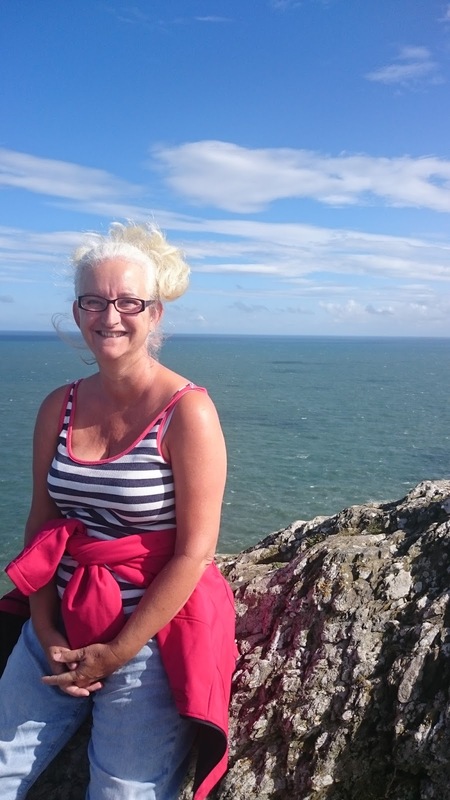 The next morning, we drove to Brean Down, a peninsula overlooking the Bristol Channel and had our breakfast enjoying the view. The tide was well out and the sands very compact, so much so that it was used as a car park, but we didn't risk it. Unfortunately it rained for a while but we later walked along the beach - a bit flat and lifeless for our liking. Back on the road, we drove down the M5 and A30, stopping off at the Tesco in Launceston before driving the last few miles to the house sit, the final mile down a narrow single track road with no passing places! 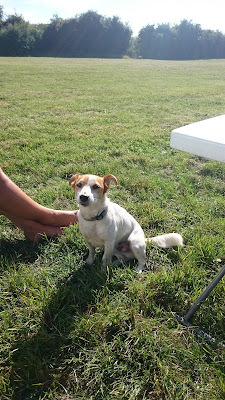 A very friendly Jack Russell, with hay fever! 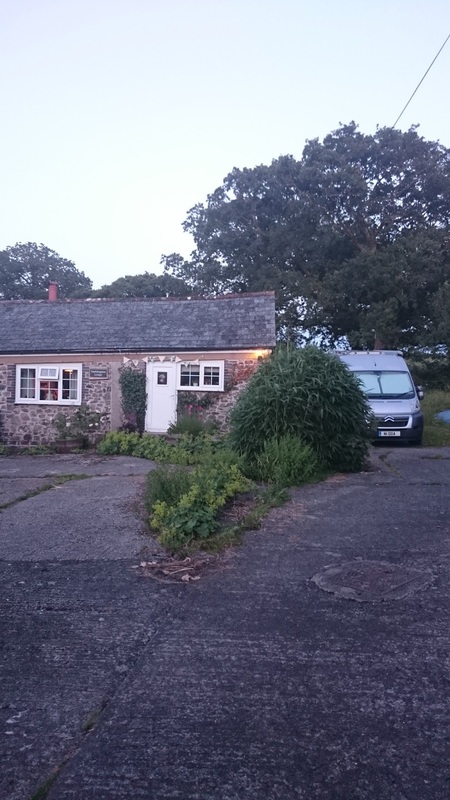 This is a beautiful cottage, part of what was once a number of outbuildings to the farmhouse opposite. It's L-shaped, with about an acre of lovely gardens, including vegetable beds and overlooking fields and hills - and oh so quiet. 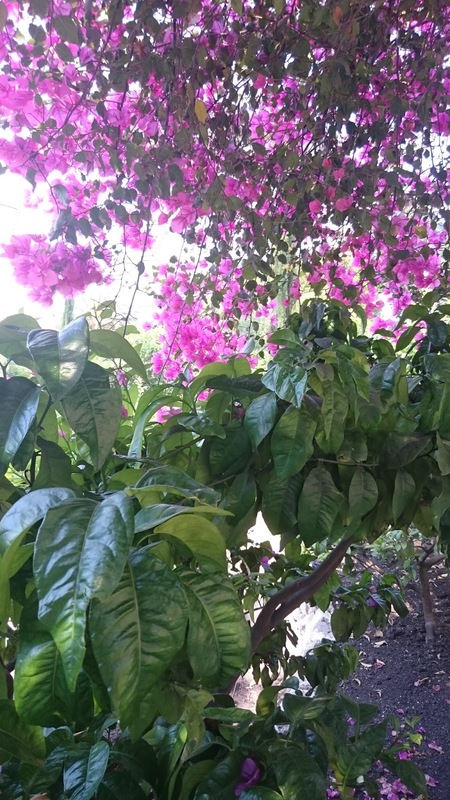 The owner has worked really hard on the house and gardens and is justifiably proud of both. We parked up the van and were met with a friendly smile and a hug - always a good start! After a quick tour around we sat down with a cup of tea to chat and start a slow handover, ready for the owner's departure the next day. 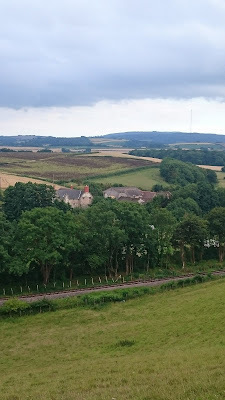 We had a very comfortable double bedroom with our own bathroom and wonderful views over the fields and hills. The owner had made us a delicious meal and we enjoyed this, soon at ease in what can sometimes be an awkward time. I think the glass of cremant before dinner, sat outside in the warm sunshine helped! 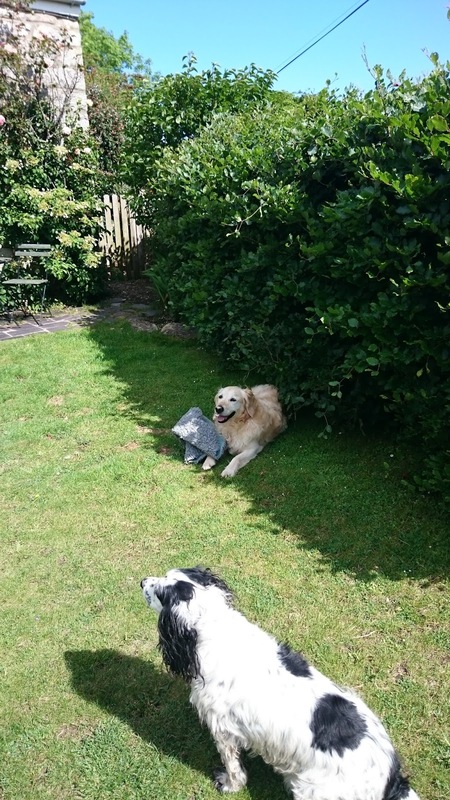 The handover was very thorough and I hope we put her at ease, as this was her first time using trusted house sitters, so naturally there's an element of trust and uncertainty. This part of Cornwall is quiet and unspoiled, with ancient field boundaries and lots of very narrow lanes (too small for our van) with often an old, abandoned and ramshackle cottage along the way. 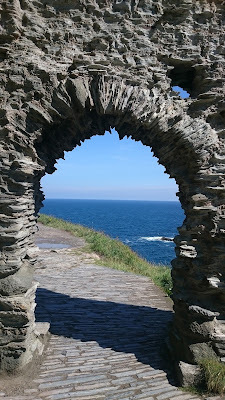 Most were in a lovely situation with outstanding views; such a shame that their history was lost in time. At the bottom of the valley was a lovely old mill, now converted into a large house. 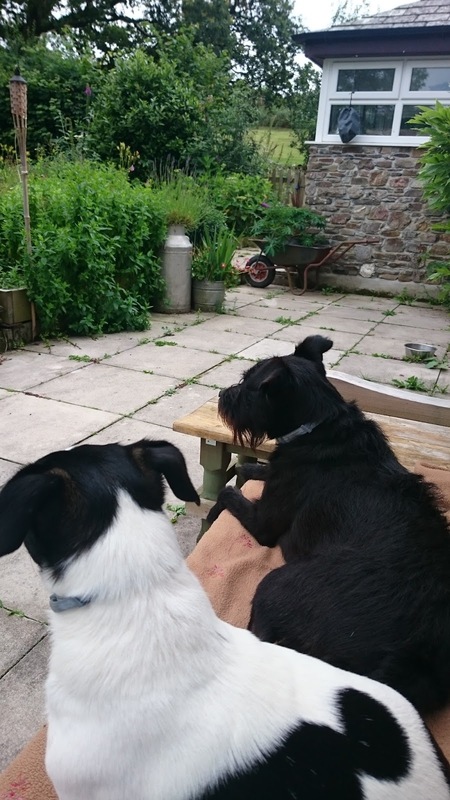 We were privileged to be looking after two lovely, happy-go-lucky terriers (our favourite dog breed! ); one a Patterdale called Charlie and the other Bertie, a Jack Russell. 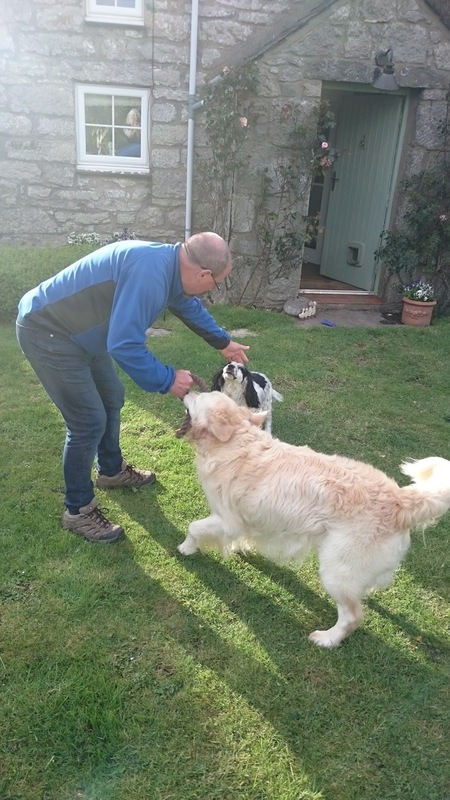 We'd already been briefed on their feeding and medical needs and we took some time to let them come to us, as we find this the best way to build up a bond with the pets; work to their timings. 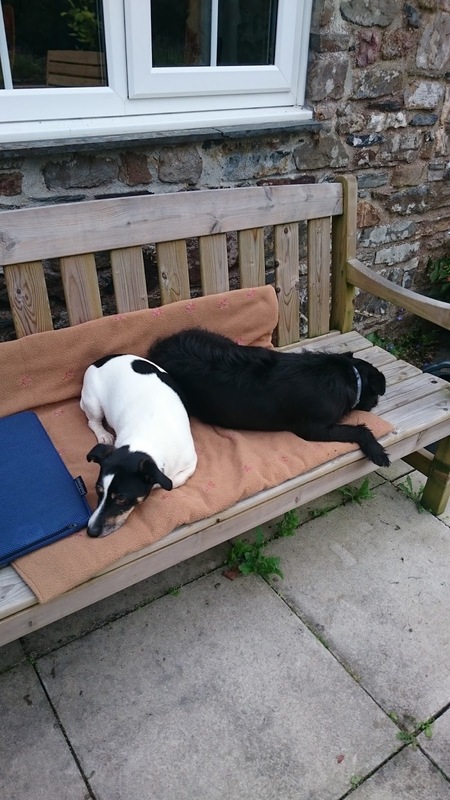 They are both truly delightful - well-trained and fun to be with; they're both lying down underneath the table as I type, happily watching the world go by and occasionally snapping at the flies! We were warned that they're both true terriers; if, on our walk, they spy a rabbit, deer or indeed anything on legs, they'll be off! 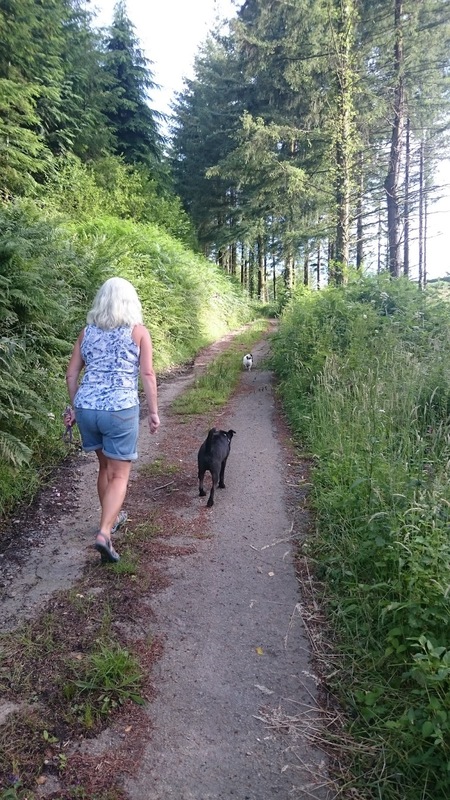 On our first evening we walked them with the owner through the woods of the Duchy Estate. They were well behaved and they've been the same with us throughout the sit. They return on command or whistle, but also have sound collars and returned when the remote was pressed - both a delight to look after. Charlie was a little more reserved but, once he got to know us, was great fun to play with and eventually sat next to us with his chin on our leg. Bertie came to us earlier and enjoyed a tummy tickle. He was also a master dribbler with his ball - you would never catch him! Both enjoyed good long walks. As the days wore on, both came to lie by us on the grass or sat with us on the benches outside. We often woke with the sunrise, which appeared over the hills through our bedroom window at about 0500 - such a delight. Sometimes a regular visitor - a large beautiful buzzard - would be sat on the garden fence. It was the perfect time to just get up and take the dogs for a good walk in the cool of the dawn. Even at this early hour the wildlife was all around us. 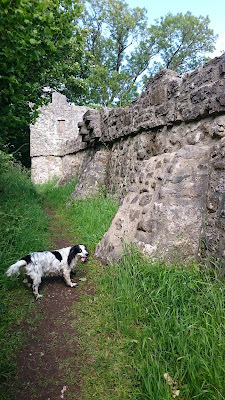 We also walked the dogs in the evening, finding several routes around the local paths and lanes. Back at the cottage, we sorted the dogs' meds and breakfast before we had ours. If staying at the cottage, we pottered during the day, perhaps doing some weeding (we introduced the owner to permaculture) and watering, interspersed with playing with Charlie and Bertie, or just sat outside reading our books. 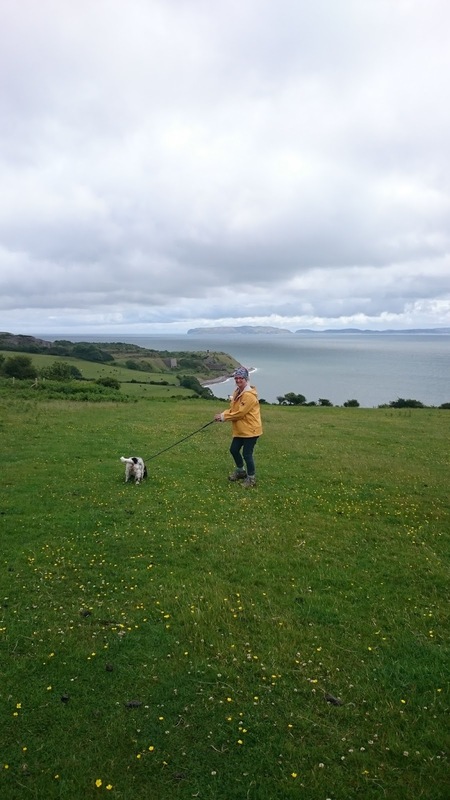 We did have one day out, which was fine with the owner as we knew we could leave the dogs for a few hours (with Radio 4 playing in the background!). 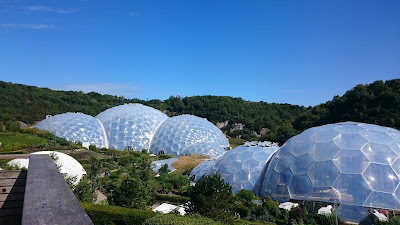 We had a lovely return trip to the Eden Project, our third visit since it first opened in 2001. On the day we visited it was very warm outside and even hotter in the rainforest biome. 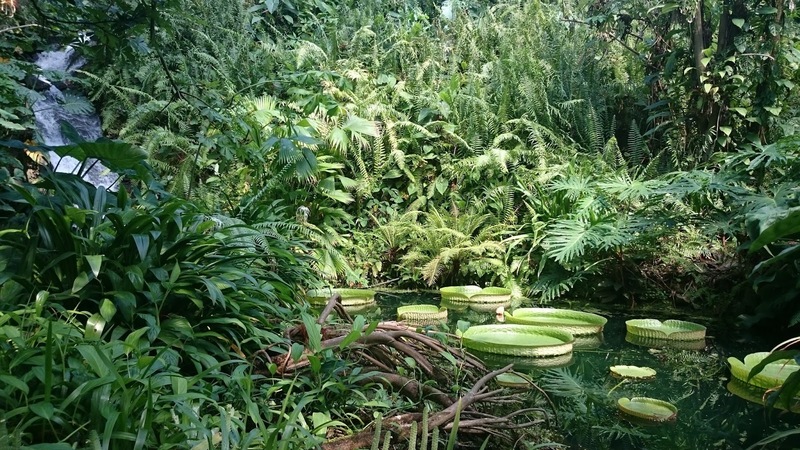 We'd also planned a return trip to the Lost Gardens of Heligan, but decided to give it a miss this time; we'll return one day. 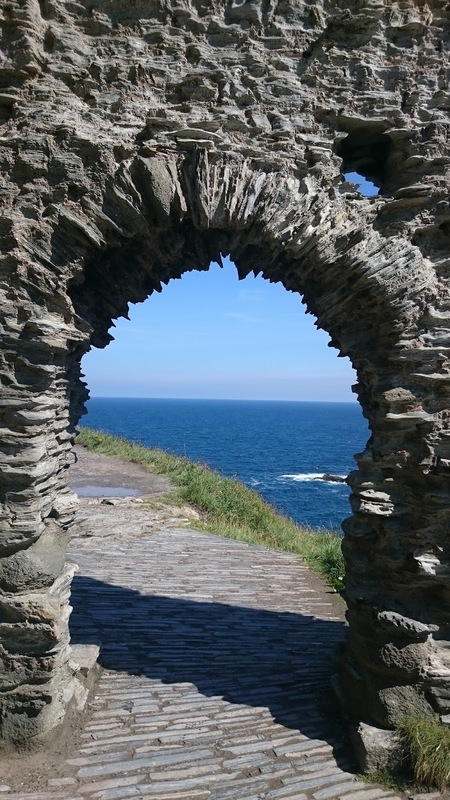 In this part of the world there are so many places to visit or walk around; it's a beautiful part of the country. I also managed a 15 mile bike ride around the lanes - the hills are very steep here! 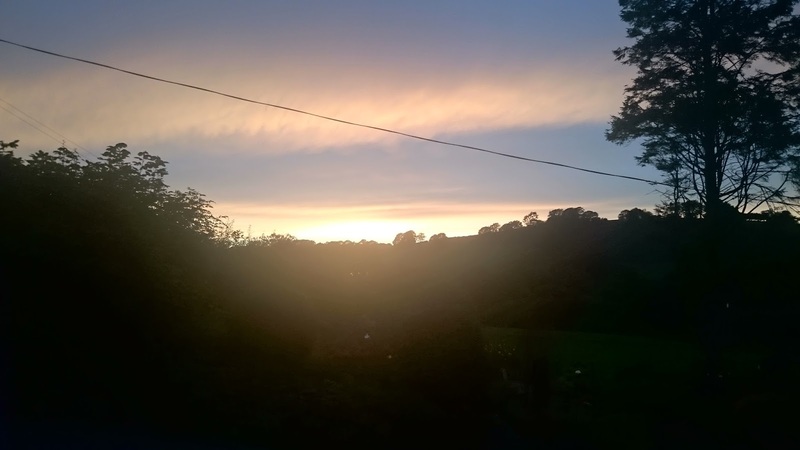 I collected the owner from Gunnislake train station on her return, We'd arranged to stay over that final evening so she wouldn't have to worry if her train was delayed. I cooked us a vegetarian dinner (halloumi kebabs with satay dip, Thai vegetable curry and fried rice, finally Creme Catalana with a (freshly picked) rhubarb and ginger base) and we enjoyed a glass of cava sat outside beforehand, catching up on our respective experiences over the past days. This is one of the delights of house sitting - meeting interesting people and sharing ideas, adventures, pasts and laughter. 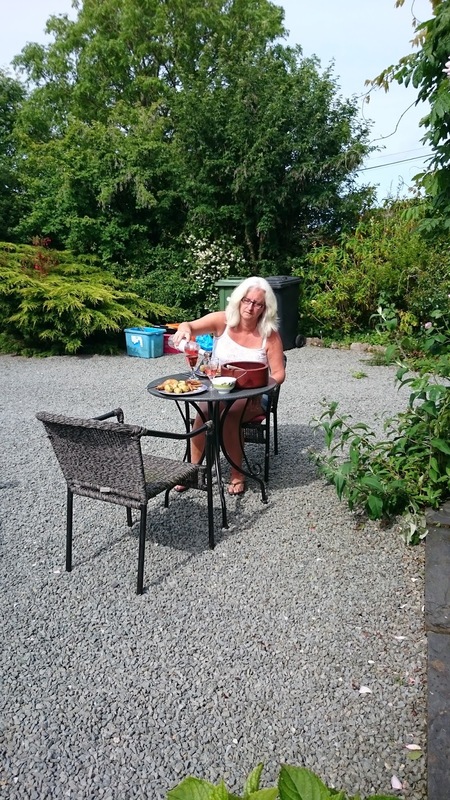 Having stayed over on this final evening, we shared breakfast before saying our goodbyes. We were off to spend a day and night exploring Tintagel (on a car park that allowed overnight stays), with another night at a beachside CS in Somerset before our drive home. 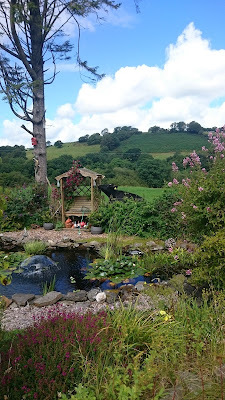 This has been another great housesit, in a lovely part of the UK. 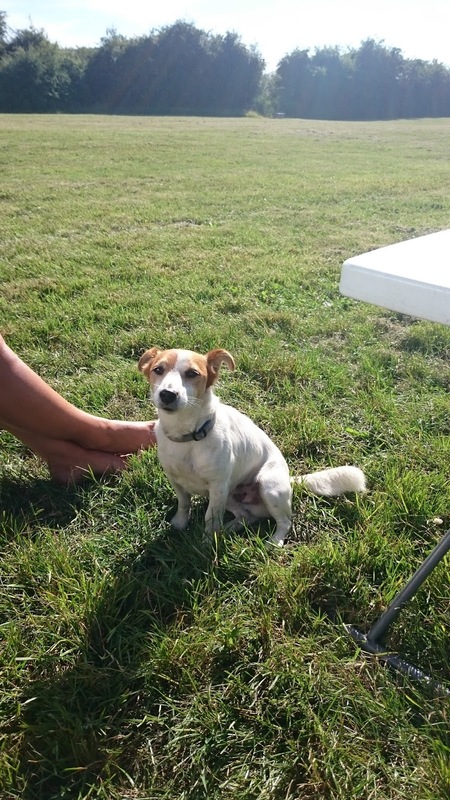 We were blessed with great weather, a beautiful property in outstanding countryside and two delightful dogs to look after. We hope we may be able to return one day. It's been exactly four weeks since I left On the Beach. Time has flown and, looking back, we've fitted a lot in to those 28 days. 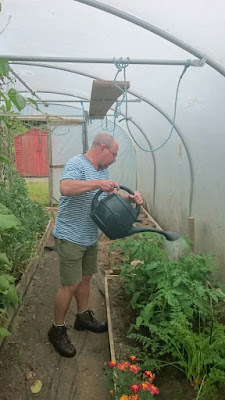 Having spoken to a few friends who've been retired for some time, they all told me the days would go quickly and I'd struggle to fit in all the things I want to do; they're not wrong! Have I thought about work - not at all. Have I thought about those I worked with - yes; in all good jobs it's the people that make it and the Development Team at OTB were (and still are!) one of the best. One of the great things is that I don't need to cram everything into a weekday evening or short weekend. If I aim to do something today and don't, well there's always tomorrow. Similarly, if we wake up to a warm sunny day, sod the plans - we get out and enjoy it! Same if we wake to rain. This week is a good example. 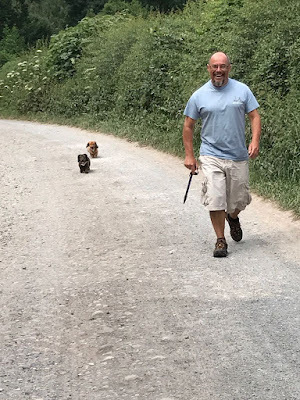 Monday was warm and sunny so we quickly arranged to take a walk in Delamere Forest with our friends and their two daschunds - Charlie and Izzy (it was these friends who got us into the campervan life when we first hired a motorhome from them five years ago). 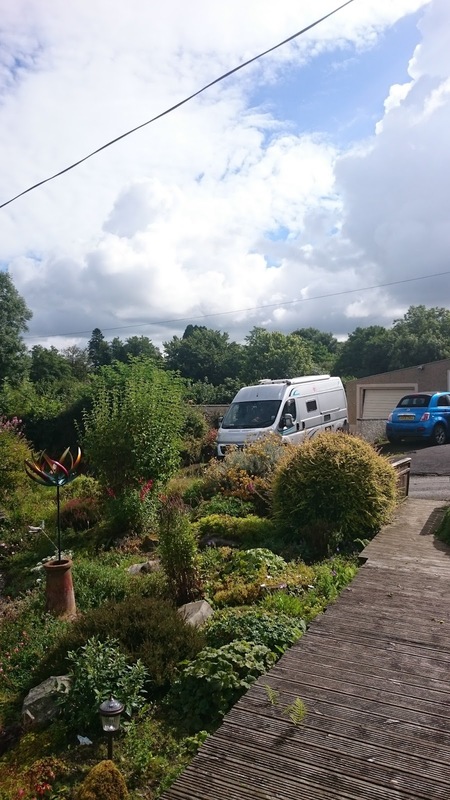 They had recently returned from a two month trip in their motorhome to France, Spain and Portugal so we wanted to catch up and hear all about it. The five mile walk quickly went as we chatted about their trip, plus our past month and future plans. I also played 'pied piper' to Charlie and Izzy as you can see from the photo below. We all returned to our garden for a coffee and a longer chat; with no other calls on our time it was lovely not to clock watch. For once I'm not the one with the shortest legs in the group! And today is the other end of the spectrum - raining all day (as it is all across the country). Our day began the usual lazy way - a cuppa sat in bed catching up on the news, email, twitter. Once up I spent a couple of hours ringing around for home insurance quotes; I wanted a policy that would cover us for long periods away from home. Each call took about 15 minutes as I answered all the usual questions. This is something that would have eaten up half a precious weekend day in the past but now is a relatively relaxing task. I went with the Club Care via the Camping and Caravanning Club in the end - much cheaper than all the other quotes and the most helpful and cheerful contact centre staff. One of the other companies I called clearly didn't want to sell home insurance; the agent was surly and not sure of the details. At one point I thought she was going to actually say "whatever"! At over £200 more than the C&CC, "Paul said no"! 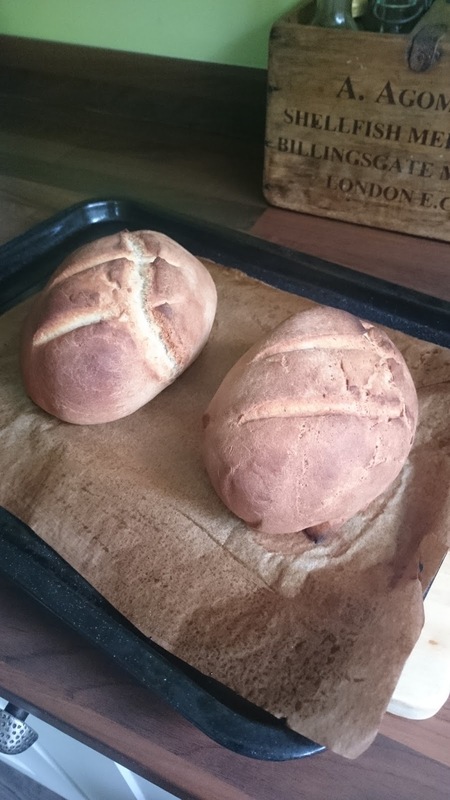 In between that I've baked some bread, although the frozen 'fresh' yeast is past its best now I think as the rise wasn't as good as hoped. 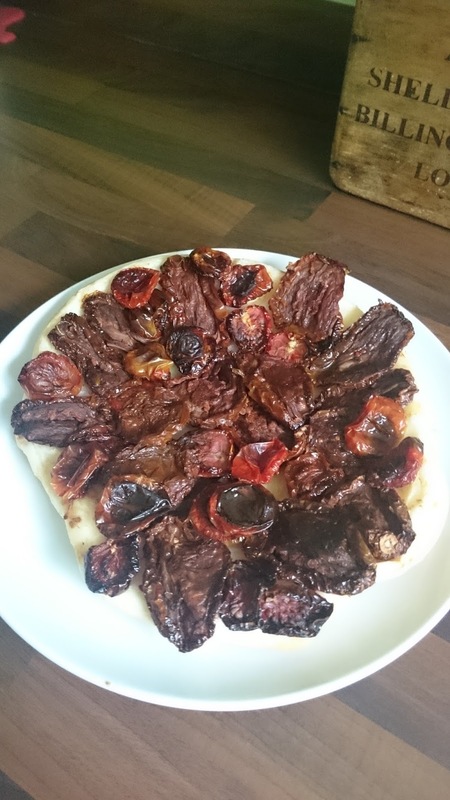 I also made a tomato tartin (a bit of an experiment for an upcoming vegetarian meal - I think it'll work better if I use super-ripe tomatoes). With the left over pastry I knocked up a feta and spinach 'pasty'. Later on I may start to sort out some of the motorhome magazine articles I've saved for our first long trip to Europe later this year. But, if I don't have time to do that, there's always tomorrow. The first time I looked at the clock today I expected it to about midday - it was 3pm. So what else have we been up to? Our first few days of retirement were spent on a trip to Northumberland, mainly because we were ready for a break (and because we can!). Then we were back home for a couple of days before we did the first of our post-retirement house sits, this one in Anglesey. Back home for about a week, I managed a couple of bike rides plus the odd five mile walk (we're trying to get out every day for this, weather dependent) and we helped Cathy's sister with some furniture moving and gardening, again something that in the past would have been squeezed into a weekend. 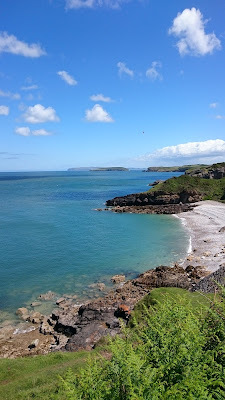 Then it was off for a few days on the Llyn Peninsula in the campervan. 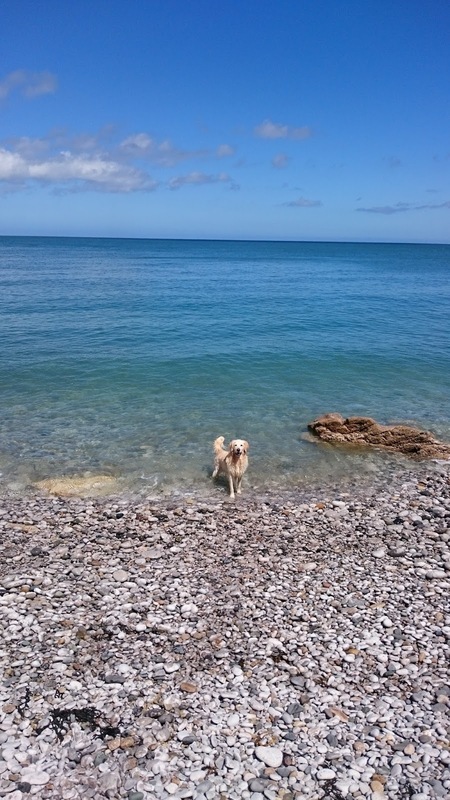 The weather was glorious and we swam in the sea every day. 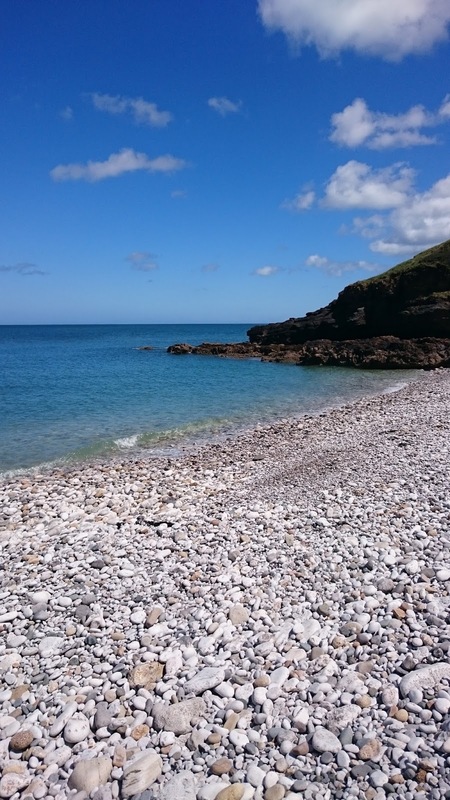 With it being in the week, it was much quieter on the roads, footpaths and beaches. Now we're preparing for another (and our longest so far) house sit, this time 10 days in Cornwall, leaving in a few days' time. 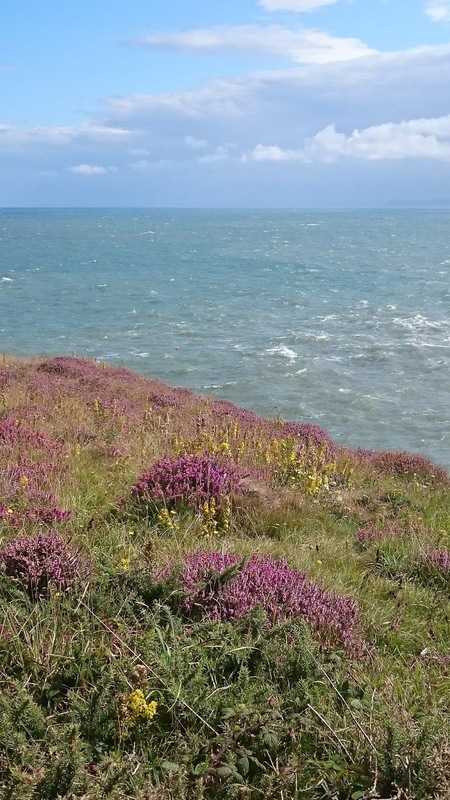 We also have another 10 day house sit in August in Ceredigion, mid-Wales and are looking out for one in September. By then we'll be into the final planning for our 4 month trip to France, Spain and Portugal over the winter. 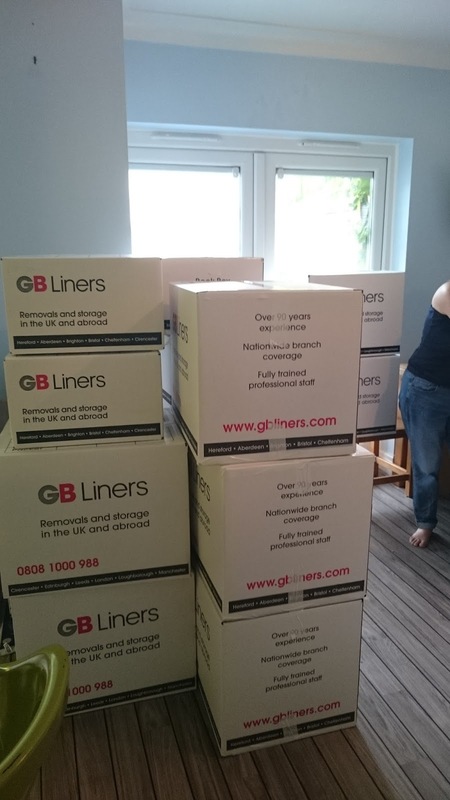 So time has flown and we've packed an awful lot in to the past month. Around all this has been some 'admin' to amend insurance policies (to tell them we're both retired and mortgage free!) and also update personal tax allowance usage. We're still, I think, in the honeymoon period of early retirement in that it still feels a bit like an extended holiday. But we're managing OK with our spending, the main change being that time away in the campervan is not a holiday (so less eating out and fewer pubs) but our new way of life (so cooking fresh and tasty food). 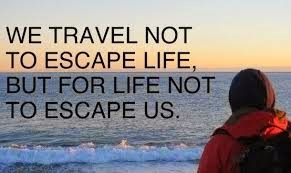 We have a busy few months to come and our first winter trip abroad in the campervan will further inform us if we like this sort of life - I'm sure we will! We have further plans to travel more widely and at different times of the year, interspersed with house sits.....if we can fit it all in! I'm sure they'll be some downtimes too (especially if poor weather keeps us indoors for too long) but we'll ride those out. But first month in, we're 'living the dream'. We woke to a work-time alarm at 0545, a bit of a shock to the system for a pensioner and a drop-out! We were out and at the Polling Station for opening time at 0700; it was already quite busy. Back for breakfast, load up and a drive to Anglesey through wind and rain. We stopped off at the Waitrose in Menai then on to the house sit, near the village of Penmon on the Isle of Anglesey. We've visited Penmon Point a few times and also parked alongside the Menai Straits on the odd occasion, so know the area quite well. The cottage we're housesitting was down a long, narrow country lane. Parked up, we were warmly and enthusiastically welcomed by Jess the golden retriever and Meg the springer spaniel! We had a good, thorough handover with the owner, including doggy routines, before she left for a long weekend. Car unpacked, we quickly changed into walking gear, grabbed the leads and headed off to take both dogs for a walk. We were soon crossing the fields towards Penmon Priory, where we stopped to take a look at St Seiriol's Well. 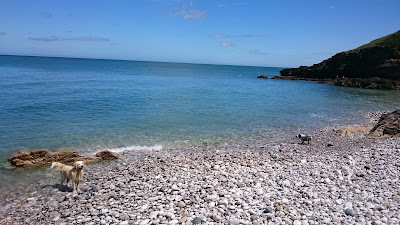 We followed the road down to Penmon Point and on to the pebbly beach. 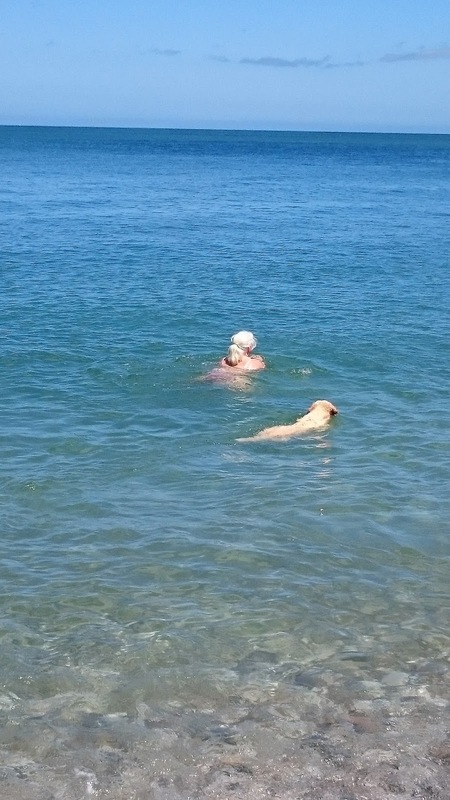 Jess had sniffed out the sea and nearly dragged Cathy into the water! Both dogs had a good swim; Meg was content with a couple of dips but Jess really didn't want to get out. 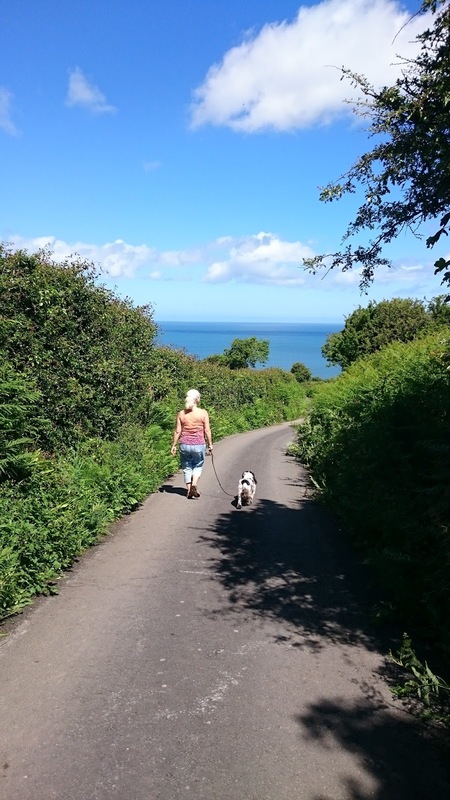 It took a while to entice her out and back into her lead, before we followed the coastal path back along the peninsula, crossing several fields before returning to the cottage. We'd already been briefed to give the dogs a hose down on return and that they wouldn't be that keen! But they were fine and were soon rubbed down with a towel and back in the garden for a well-earned treat. I popped into Beaumaris for a couple of bits while Cathy lit the log burner in the upstairs living room, with views over the hills on one side and the sea on the other. The dogs had a good snooze followed by their dinner, while we had a lamb and veg stir fry. The forecast for tomorrow is better, so we'll take the dogs out for another good walk. 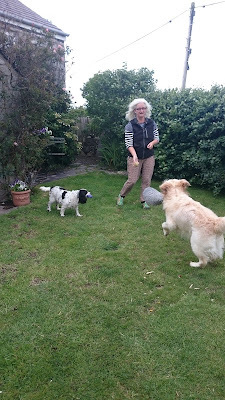 Once we'd eaten we spent a good half an hour outside with Jess and Meg playing pull the rope and chase the ball, plus Cathy gave them both a good brushing; it was blowing a hooley so the hairs soon disappeared, no doubt to become nesting material for the myriad birds. They really are lovely dogs - Meg (the springer spaniel) is fairly quiet and reserved, but loves a cuddle. Jess is more of a handful and likes to play tug of war and 'test the waters', but is still a lovely, friendly dog. When out for a walk she's very much the 'mother hen' checking to make sure we're all still there. We're all weary tonight so I think we'll all sleep well, ready for another day by the sea. What an amazing, chilled out day! It was peacefully quiet last night and we slept well, although woke up early. I was first up, fed the dogs and sat in the kitchen enjoying a cup of tea in the peace and quiet. Madness had descended overnight with the general election but I feel far enough removed from it here not to harp on about it. 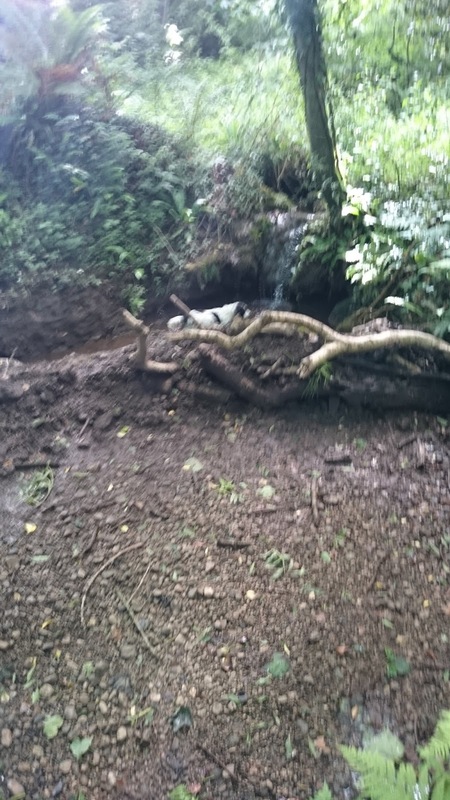 We enjoyed our breakfast and took the dogs out for their first walk, down a footpath through an ancient forest with a stream flowing down the middle of the small valley. 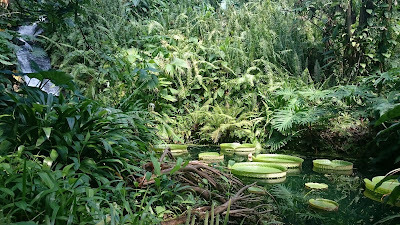 It was cool but full of life, with lots of vibrant greenery and and abundance of birdlife, butterflies and bees. The path took us down to the clifftop but no further, so we had no choice but to reverse our route back up; Meg was let off the lead and, in true cocker spaniel style, enjoyed racing up and down the valley and through the streams. Close to the top we bumped into Ken and his border collie - Millie, who we both met briefly yesterday. We had a good long chat - he was fascinating to listen to. He grew up in Knutsford (like Cathy) and moved to the island about 20 years ago, having had to give up work due to failing eyesight. He now renovates old organs in a man-shed in his garden. 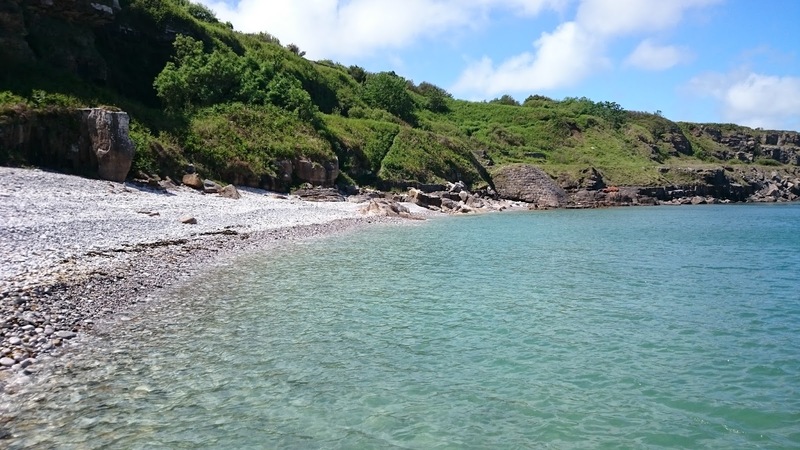 We mentioned visiting a place called white beach and he told us some of the history of the old quarry by the beach and how to get there. Jess had other ideas though, dragging us back towards the cottage, so we went back to have a brew and play tug of war in the garden for an hour (while cooked a chicken for later). 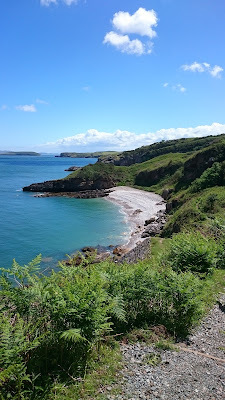 Refreshed, we took the lanes and eventually branched off along the coastal path. This particular stretch was lovely - along old field paths, through wildflower meadows and past old Welsh cottages. Ken's directions were spot on and we eventually walked the final stretch down a single track road which ended in a small National Trust car park at Fedw Fawr. We followed the path down and white beach appeared to our right, with Puffin Island in the foreground and the Great Orme in the distance - what a beautiful spot! 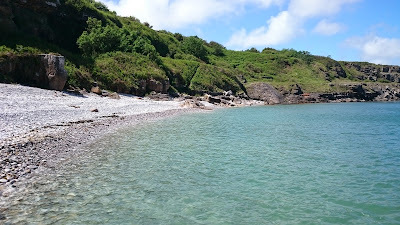 We let Jess and Meg off their leads and they soon disappeared down the path and steps to the pebbly beach. 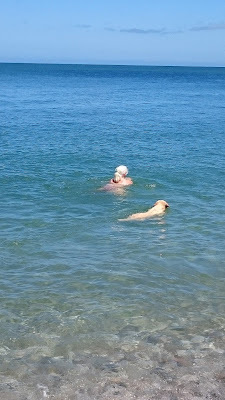 They were both in the sea by the time we reached the bottom, enjoying a welcoming cool off. Cathy was soon to follow (with a 'whoop' as the sea was a bit chilly!) and it was funto see them all swimming together. I took a few videos and photos then joined them in the sea; it WAS cold but I eventually got used to it and was whooping with the best of them!. 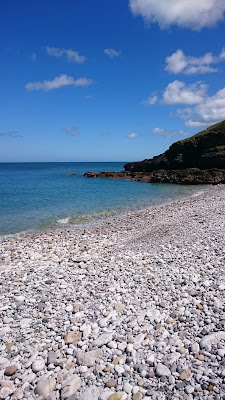 We hadn't taken any swimwear or towels with us, so we swam in underwear and dried off in the sunshine afterwards. 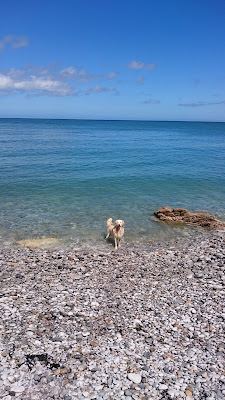 The dogs continued to play in the sea and on the beach, as we explored the strand line and rocks. It was the sort of place you could arrive early in the morning with chairs and a picnic and spend all day without seeing another soul. After a great swim, we dressed and reversed our route, enjoying the warm sunshine back through the fields and along the quiet lanes. This part of Anglesey so reminds us of the secluded villages of France; not only the lack of traffic but the quiet lanes and stone cottages. Back at the cottage, we showered and changed and I prepared our dinner - the cooked chicken, some new potatoes boiled and served with mint from the garden, plus a salad and a dijon mustard, raspberry vinegar and olive oil dressing, all washed down with a bottle of Portuguese rose wine. Once we'd eaten I fed the dogs; Jess is on special, hypoallergenic food and Meg is on normal dog food. They were clearly ready for theirs as it was gone in seconds! Now sat in the upstairs living room, both dogs are crashed out after their busy day. I'm blogging (of course) and Cathy's learning some Greek via Duolingo. Later, a pot of coffee and some bara brith beckons. What a lovely relaxing day; for the first time I felt properly retired, enjoying a holiday-type existence on what is (for most people) a normal working day. The weather forecast for tomorrow is dire - wind and heavy rain - so I think it'll be an in day; maybe I'll bake some soda-bread and watch the clouds scurry across the sea. It's a hard life! Come on in - it's lovely! Less done today due to the weather - very windy with occasional wet spells but still very warm. After breakfast I popped into Beaumaris for some shopping. I was back in the Little Chilli Shop, buying some dried chillies - smoked chipotle, habanero and kashmiri - plus some fresh tumeric. 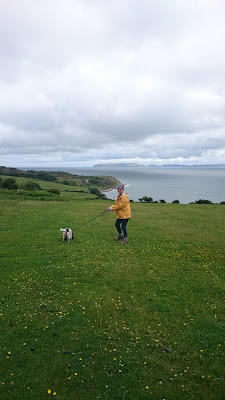 Back at the cottage we headed out with the dogs for a walk to Penmon Point, only this time the reverse route. 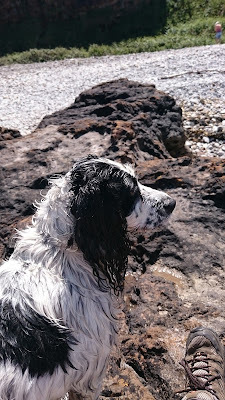 Jess was most dis-chuffed at her lack of sea swim time, but it was an ebbing tide and perhaps not so safe. We were pretty wet by the time we got back, so a brew and some TV was called for. I cooked dinner later - chicken fried rice - then the dogs had theirs too. After that the sky cleared although it's still blowing a hooley, so we played outside with the dogs for a mad half-hour. Now inside, I'm watching the high white clouds scud across a blue sky. Tomorrow is set very windy still but with less rain. 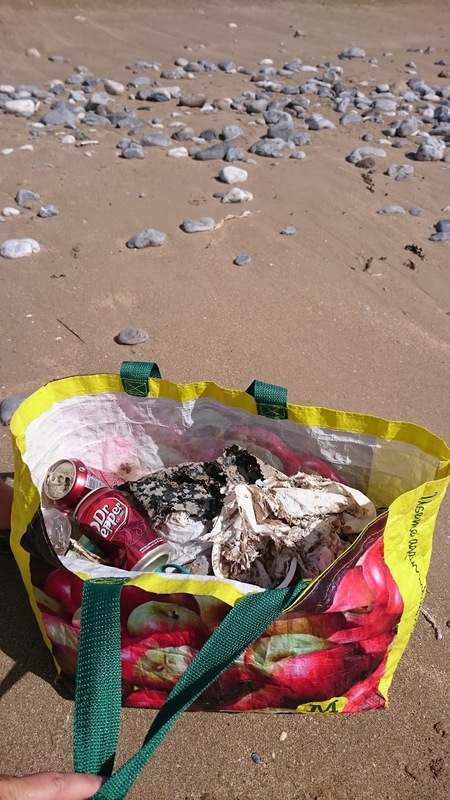 It's also National #2minutebeachclean day, so we plan to combine a first visit to Llanddona beach with a bit of a clean up. Today has been a windy day - a very windy day! Anglesey is known for the wind and it really hasn't let up all day (and is still going strong!). I don't think it's dropped below 40mph all day and probably gusting way above 50mph. But the sun shone so the combination of sun and wind has left us not only battered a bit but also very brown! We packed a lunch for our day trip. 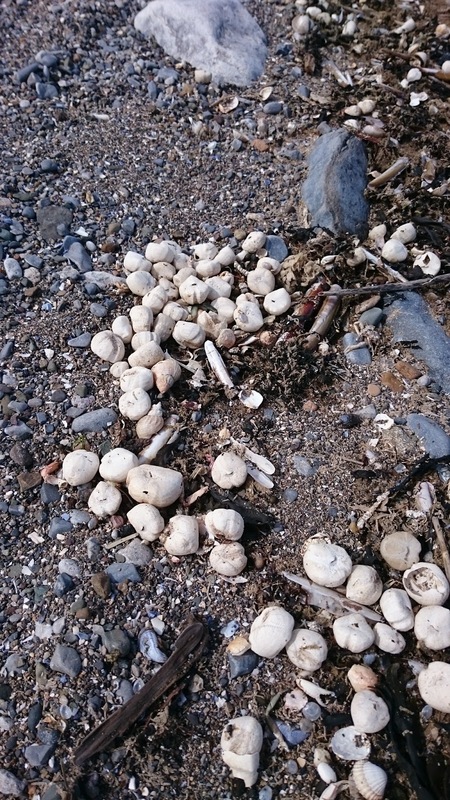 We wanted to visit Llanddona beach to do a #2minutebeachclean. It's a no dogs beach at this time of the year, so we had to leave Jess and Meg at the cottage. It was only about 15 minutes in the car, with the final mile or so down a 25% steep single lane road (in fact all the roads were single lane) - at the bottom I saw a sign for a road climbing at 35% - not one for the bike! There's a large free car park by the beach with some toilets. We grabbed our bags and walked up and down the beach, picking up litter - mainly plastic bags, plastic bottles and drinks cans, but also a child's shoe and some socks. We also found some nylon fishing net, which we kept to take home for the garden. 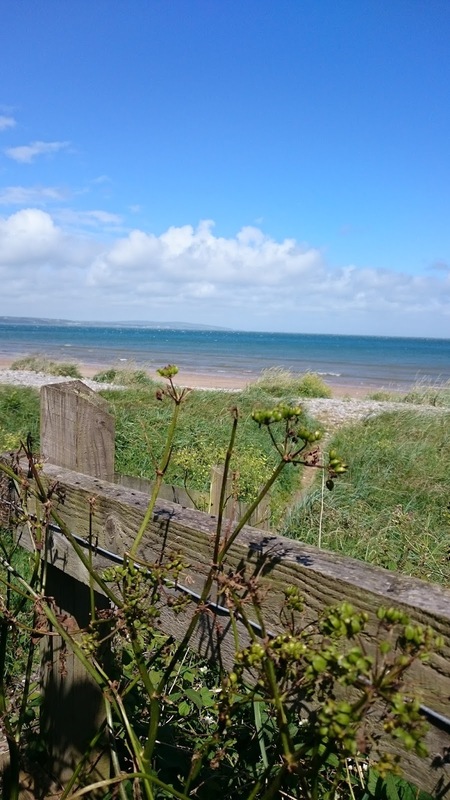 We walked a little further towards Red Wharf Bay, but the very strong wind resulted in us being sand blasted, so we turned back to the car park. Beach clean done, we drove back up the steep lane and headed for the small car park above white beach; it was quite full but we managed to squeeze into a space. There were a couple of people on the beach this time, but it still felt empty. We enjoyed our lunch sat on the (unforgiving!) pebbles down by the sea, then had a wander around, again filling a bag with rubbish. Jess and Meg were pleased to see us and after a brew and a game of tug the blanket, we took them out for a long walk. We stuck to the lanes to start with and again came across Ken and his dog Millie, stopping for a good chat. It turned out he used to be the rent collector the the house Cathy lived in in Knutsford - small world. 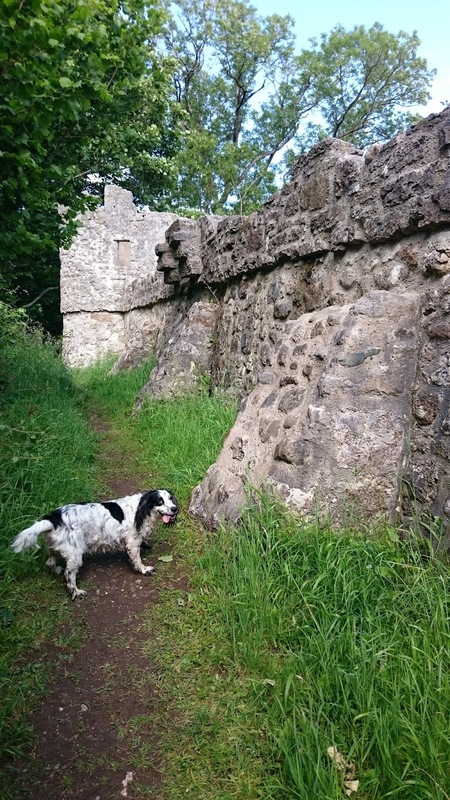 We took a footpath and made our way down to the village of Llangoed, walking through the nature reserve including visiting Castell Aberlleiniog, a small ruined castle on top of a hill surrounded by a large but now overgrown moat. We carried on through some lovely wildflower fields with small copse of young oak trees, before returning to the lane and walking back up the road through Penmon towards the cottage. On the way we met a lady walking the other way with a border collie; she recognised Jess and Meg and we had a brief chat. Everyone is so friendly here. Back at the cottage Cathy kept the dogs occupied outside while I prepared a spanish tortilla and salad. She then came in with a package of newspaper containing 5 small mackerel. The neighbours were chatting to her and mentioned they'd caught them off white beach this morning; the same beach we sat on for our lunch. So the parcel was passed over the fence and I quickly cleaned them - what a kind thought. 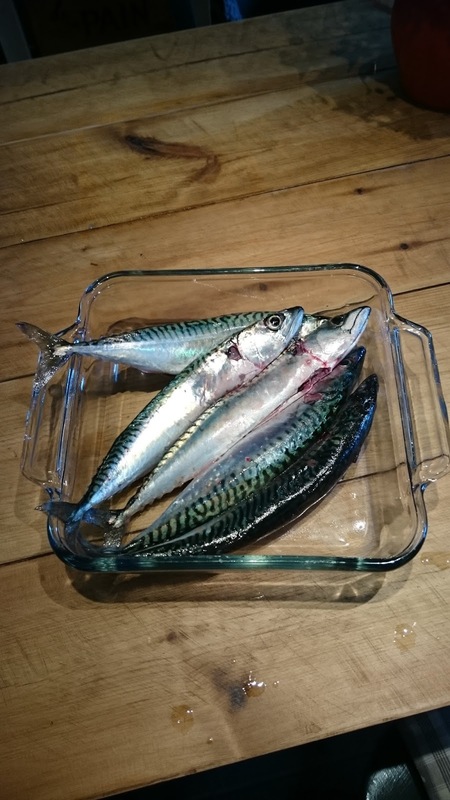 We enjoyed them grilled with sea-salt and eaten with our hands like sardines, followed by the tortilla and salad - a lovely meal. Cleared up, showered and dogs fed, we're now relaxing in the upstairs lounge as the wind continues unabated, with the occasional sharp shower hitting the velux windows in the roof. We're both tired so I don't think we'll be late to bed, ready to pack, clean up and hand this lovely cottage and the dogs back to the owner tomorrow. 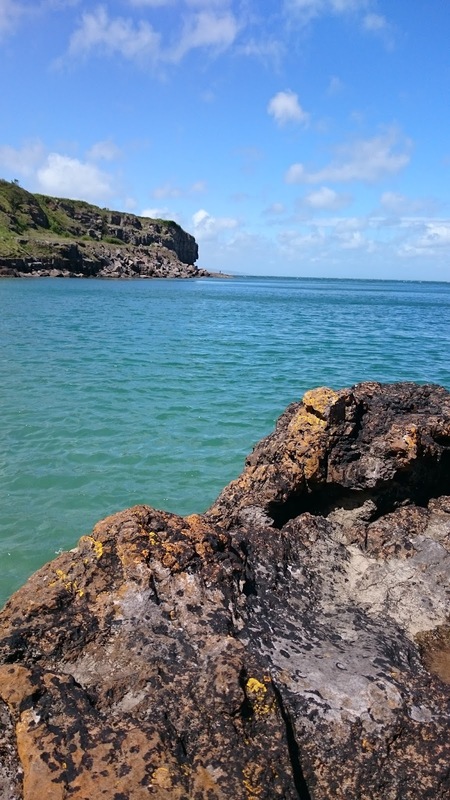 We've had a very relaxing few days in a beautiful part of Anglesey. We'd not really explored this area much before, but the countryside, quiet deep lanes with high hedgerows, plus the many paths and lovely beaches really remind us of Cornwall. It's only served to reinforce our wish to move to the island.